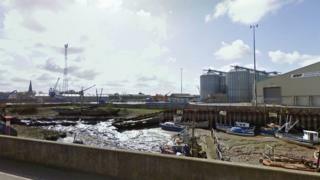 A crewman has died on a board a cargo ship in Norfolk. The man suffered what East of England Ambulance Service described as a "traumatic injury" on the SMN Explorer at King's Lynn on Thursday morning. An ambulance, rapid response vehicle and ambulance officer were called at 11:28 GMT. The man died at the scene. The vessel sails under the Liberia flag and is on charter to Scotline. The Marine Accident Investigation Branch said it was investigating. The SMN Explorer is 268ft (82m) and was built in 1996. Scotline, based in Romford, said the authorities and the owners of the ship would release a statement once the full facts had been understood. "Our thoughts and deepest sympathies go out to the family of the crew member involved," a spokesman added.